Some Opera This Weekend, Perhaps? 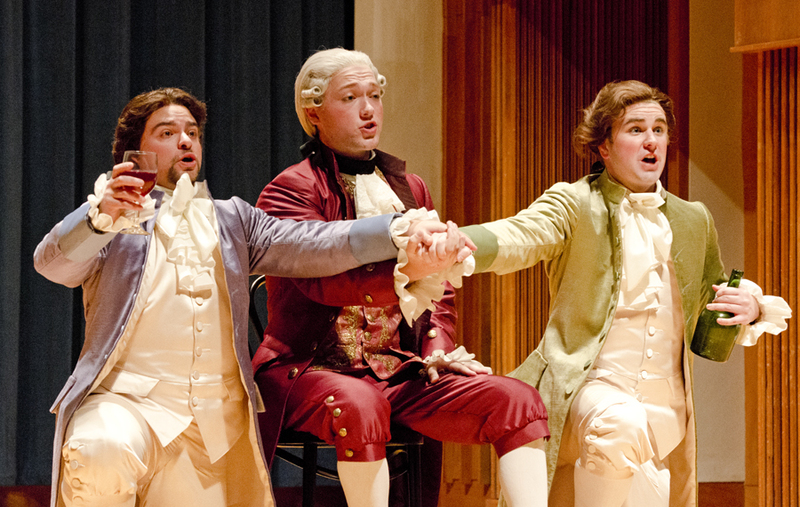 People are often surprised to hear that you can study opera at Penn State, but faculty members Ted Christopher and Bev Patton have a cool little program going, and their students will perform excerpts from a Mozart opera called Cosi Fan Tutte this weekend in the Music Building’s Esber Recital Hall. I got a sneak preview last evening at a dress rehearsal and, as was the case the previous two times I saw Penn State students perform opera (see stories here and here), I was impressed. The voices are great, and the costumes for this show—designed by Richard St. Clair, head of costume design at Penn State—are terrific. Cosi fan Tutte is a comedy whose title translates to “Thus Do They All,” though in the context of this opera, it means something closer to “Women are Like That.” Even though I’m a bit opera-impaired, and I was concentrating harder on getting photos than following the plot, I found it plenty entertaining—and laugh-out-loud funny in some spots. And below are the two leading women in the opera, who are engaged (at the beginning of the story, anyway!) 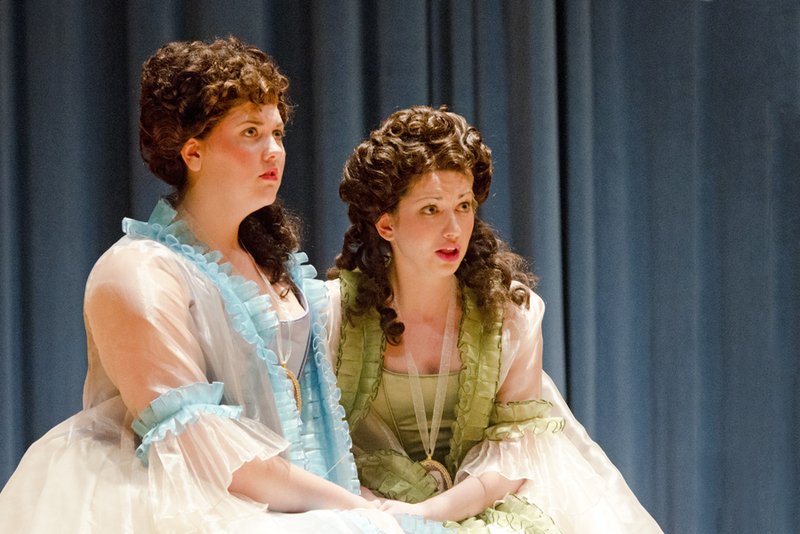 to Ferrando and Guglielmo: Fiordiligi, played by senior Julia Wolcott, and Dorabella, played by freshman Lisa Rogali. Don’t let all of those Italian names intimidate you: They sing the whole thing in English. 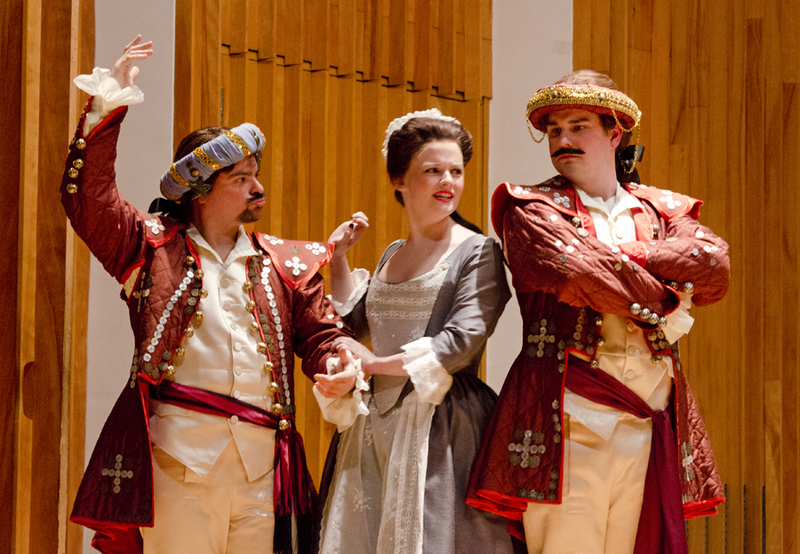 You can see Cosi Fan Tutte tomorrow (Friday) at 8 p.m. or Saturday at 8 p.m. in the Esber Recital Hall. Admission is two bucks for students and $4.99 for non-students, with tickets available in the recital hall lobby starting 45 minutes before curtain. Entry filed under: Uncategorized. Tags: Bev Patton, Carlos Feliciano, Cosi Fan Tutte, Jamie Rapaport, John Carpenter, Julia Wolcott, Lisa Rogali, Michael Hanley, opera, Richard St. Clair, Ted Christopher.